I became fascinated by the Matthew Hopkins thing quite a while ago because it was all local history to where I was living in Cambridge. It all happened in that sort of area. I went to a couple of museums that had a lot of his scriptures and books on display. There's something really bizarre about that whole time and the fact that this guy was just travelling around the countryside holding witch trials. It's so strange that all of that actually happened. It was a huge influence when I was writing Blood lust. I took a lot of that from the film. 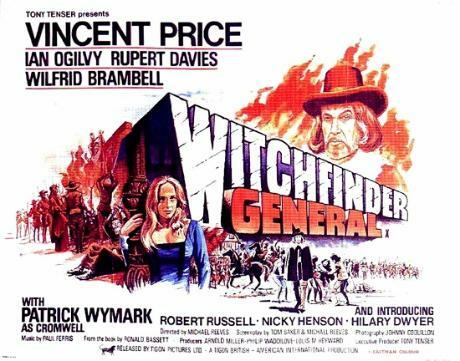 It's a very well directed British horror film and Vincent Price is fantastic. For me it's one of his best performances. He tones it down quite a lot. There's a particular strain of British horror about the mystical elements at work in the countryside. Is that something that's been important to you? Hugely. And I think again, it goes back to where I was living. You'd be walking around these villages and expecting a witch burning to be happening at any moment. All the really old buildings and the flat countryside of the fens and that kind of stuff. There's just something really witchy about it. It's had a huge influence.